Click here for #GivingTuesday information. 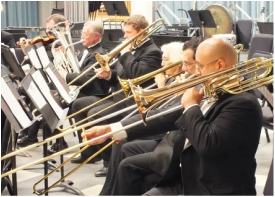 ​The Valley Wind Ensemble is a 501(c)3 non-profit community-oriented organization dedicated to providing concert band music throughout the Santa Ynez Valley. The total cost of performances, including sheet music, publicity, postage, rehearsal hall rental, and even refreshments is paid for by the musicians themselves - and patrons like you! Donations to the Santa Ynez Valley Wind Ensemble are tax deductible. ​The Valley Wind Ensemble is a 501(c)3 non-profit volunteer group of local musicians who gather weekly to make music.